Being open-minded is a skill I encourage every leader I work with to develop. Over the last few years, the topic of shifting our mindset to improve and create the results we want has become prevalent in most leadership circles. Working and developing our mindset is critical for today’s leader. Some time ago I wrote a piece based on Carol Dweck’s work on developing a growth mindset, and you can read this again here. If you haven’t read the book, I highly recommend it. 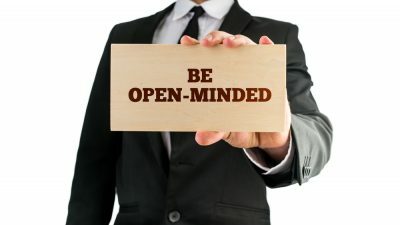 So, in this post, I want to explore the many benefits of being open-minded for today’s leader who wants to be successful. Our world is changing and at a rapid pace. Donald Trump can make a comment, and 20 seconds later it’s causing a meltdown on Twitter. The technology and A.I. capability we all have access to are wonderful. However, a consequence of its power is that we now live in a disruptive society. Disruption is fantastic when it comes to building new business models, though remember people are still at the core of every business and want leaders who can navigate a path for all to follow, disruption or no disruption. Do you think to be open-minded as a leader will help in this situation? I can answer that for you; absolutely yes. We live in a society that is growing at a rapid rate, and consequently, there are ‘challenges and issues’ everywhere we turn. 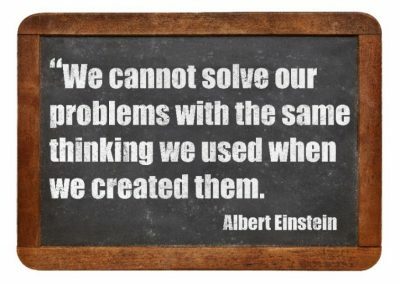 Perhaps it’s time to remind yourself of a fundamental truth that Albert Einstein shared many years ago; it’s time to change our thinking, and that starts by opening our mind. Historically as a society, we choose leaders who are predictable and unflinching (maybe I should remove my comment about Donald Trump! ), however recent research now indicates that we now need creative leaders who are flexible. In a recent post in HBR, one of the contributors shared how Benjamin Franklin, a well-recognised super-smart man, was also intelligent enough to understand that he couldn’t be right about everything. That’s why he said that whenever he was about to make an argument, he would open with something along the lines of, “I could be wrong, but…”. Saying this put people at ease and helped them to take disagreements less personally. However, it also helped him to psychologically prime himself to be open to new ideas. Let’s be honest with one another here. We can all have closed minds on certain subjects, and that is OK. Being open-minded can be challenging. We grow up and develop a set of beliefs and values and, throughout our lives, we tend to surround ourselves with people who share the same values and beliefs, and in a work situation, we often gravitate to these people too. I am not suggesting that you spend time evaluating every single idea that is presented to you. To give some context, consider this scenario when you are asking for feedback on ‘how’ to carry out a certain process from your team. Remember they are likely more involved than you with the day to day task. Perhaps their suggestions and ideas are worth exploring further instead of talking over them and powering on. 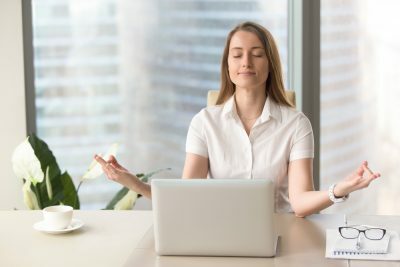 I’ll be honest and admit that I find it tough sometimes to open up to differing viewpoints and yet when I do, I experience many benefits some of which I want to share that maybe you can connect with too? Authentic leadership is the way of the future and admitting your idea might not be the best demonstrates how open and honest you are. It means believing that whatever truth you find might always have more to it than you realise. Being open to being ‘wrong’ makes all of us vulnerable. In the past, this was perceived as a weakness, which I am happy to say is no longer the case thanks to people like Brené Brown and her ground-breaking work. If you haven’t watched her TED talk yet here is a link. Being open leads to developing strength; I know, who knew! As you open to new ideas, you learn and grow. The new ideas you discover then build on your current view of the world which now broadens. Everything you experience can add up, strengthening who you are and what you believe in, which then leads onto building your confidence muscle and your own belief in yourself too. Is making mistakes a benefit? Of course. We only grow through trial and error. We see this pattern play out in all areas of our lives, don’t we? Many scientists read this blog, so I’m sure I don’t need to convince you of the benefits of experimentation. The question is, do you map your ability to be open in the lab across to working with a new idea from your team, yes or no? Ummmm thought so. This is completely freeing. Imagine being able to let go of controlling all your thoughts on a subject. You allow yourself to experience new ideas and you challenge the beliefs you currently have. It can be very liberating to look at the world through an open mind. Though we all have closed minds on certain aspects of our lives, where could developing an open mind help you?